Language education on the global scale becomes of greater importance everyday. With expanding communities through social media, sometimes language is the only barrier that separates human beings and ideas. Upon my arrival to Nablus, I felt a sincere interest and urgency in learning the local Arabic dialect from the most simple of phrases regarding food or directions to more complex vocabulary surrounding the history and culture of the Nabulsi people. Entering Nablus and jointing the TYO team as an EFL fellow, I was especially interested to know and understand the language of my incoming students. STEP! II EFL students wait for class to begin on the campus of Al Quds Open University. I began my first week of beginner level EFL classes this past Monday. I was both excited and nervous to meet my new students upon arrival at Al-Quds Open University. It is here where I would be teaching for the next 8 weeks. 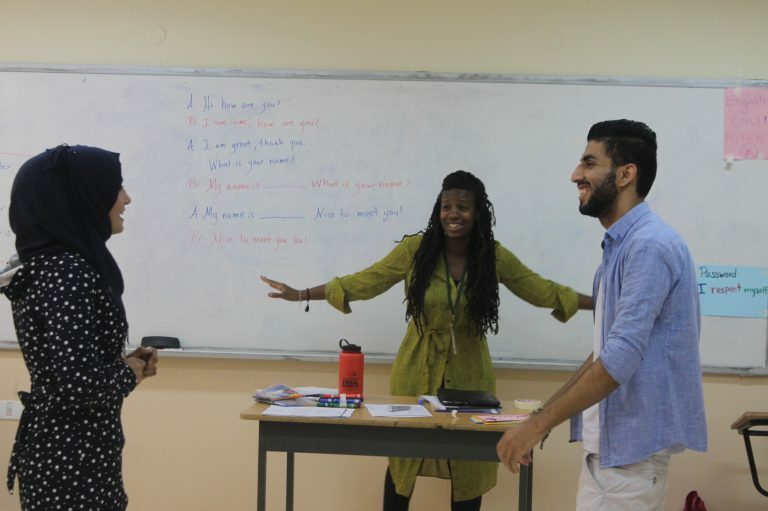 Having taught English abroad before I knew there would be a few kinks to work on the first day, I needed to get to know my students and they would need to get to know and trust me. I took a breath, reviewed my lesson plan, and awaited the arrival of my 30 plus students. EFL Fellow Mecca writes on the board as students enter the classroom in the first week of EFL class. Around 10 am, they began flood into the classroom, some smiling and excited while others curious and asking questions. I was curious about my students. I wanted to know their levels and future aspirations. We started the first class with The Name Game where you say your name and then say an object that begins with the same letter. This immediately opened the door to learn more about my students. I learned that Ala’a like apples and Khaleel likes computer programming because he mentioned a keyboard. After The Name Game, I opened up the floor to see if my students had questions for me and hands sprung up right away. They asked me about my name, where I was from, where I studied, and what I studied in school. I learned that they were just as eager to learn about me as I was to learn about them. We shared a common interest to learn to each other’s language and know each other’s culture. I saw in them the same desire and urgency to be able to communicate in a 2nd language. I am happy to share this common interest with my students. It provides the perfect opportunity for us to learn from each other. Everyone smiles as they participate in an English learning activity. Since I have arrived in Nablus 2 weeks ago I have had the pleasure to meet interact with so many members of the wonderful TYO staff. I am constantly inspired by their spirit and drive. I traveled here to teach and support personal growth. However, I anticipate an equal exchange of language, culture, and education the end.